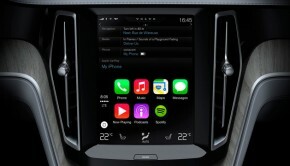 Starting in 2010 when Apple made the retina display and display quality a central theme for their product marketing, displays have moved up from the doldrums into an unprecedented renaissance of new display technologies for smartphones, tablets, TVs, and entirely new classes of products like wearable displays. That approach impressed consumers and moved the entire display industry. But Apple has recently given up the lead in displays—now Amazon, Google, LG, and Samsung are launching products with the best and most innovative displays as documented in our in-depth Display Technology Shoot-Out article series. The new iPad mini retina display, for example, came in a distant third place finish in a recent Display Shoot-Out article. Hopefully Apple will join the leaders again with new and innovative displays in 2014. Up through 2012 the increases in screen size, resolution, and pixels per inch (ppi) were at the forefront of new displays. In 2013 we witnessed the introduction of Quantum Dots and Curved Displays—two of the most innovative display technology developments in a decade along with OLEDs. In addition there are continuing developments in color gamuts and color accuracy, higher resolutions and ppi, brighter and low reflectance displays for better screen visibility in bright ambient light, and many continuing enhancements for both LCDs and OLEDs that we will discuss below. The current trends for improving the color gamut and color accuracy, increasing the resolution and pixels per inch, reducing screen reflections and increasing display brightness for better performance in ambient light will accelerate in 2014 due to new technologies and increased competition. Quantum Dots are going to revolutionize and reenergize LCDs for the next 5+ years. While they have been under development for many years, in 2013 they made it out of the labs and into consumer products: in some models of Sony Bravia TVs, with Quantum Dots from QD Vision, and in the Amazon Kindle Fire HDX 7, with Quantum Dots from Nanosys, which we recently tested in a Display Shoot-Out article. In 2014, there will be many new LCD smartphones, tablets, and TVs with Quantum Dots, as manufacturers rush to stay competitive, but note that many of these products will not mention Quantum Dots in their marketing. Samsung Galaxy Round smartphone and the curved LG OLED TV to identify how the curvature improves display performance. It’s important to note that the curvature is small and subtle—the edges of the screen are just 0.10 inches higher than the center for the 5.7 inch Galaxy Round, and just 1.4 inches for the 55 inch LG TV. That is just the right amount to significantly improve image quality when watching in ambient light, but they are not so heavily curved as to provide a panoramic visual surround or interfere with viewing off axis (as many reviewers have suggested). The subtle TV curvature improves off axis side viewing because the curvature reduces the keystone (trapezoidal) image distortion and foreshortening seen with flat screens by as much as 50 percent – but it’s overlooked as normal because people are used to seeing it. Most curved displays use OLED technology, although there are also some curved LCDs. As a result of these performance enhancements, more products will be developed with curved screens, but the shipment levels in 2014 will remain low due to limited production capacity. However, these innovative curved screen products could also stall in the marketplace because consumers don’t yet appreciate their significance. Flexible and Bendable Displays: the Galaxy Round is actually made with a flexible OLED display that is placed under a fixed curved cover glass. In our Shoot-Out article we also tested the same display without the cover glass as a free standing flexible display (like a flag attached to a flagpole that is bendable in any direction, but not foldable). It performed even better than the fixed curve Galaxy Round, but products with free standing flexible displays are unlikely to arrive before 2015. What will undoubtedly appear in 2014 are smart watches with flexible curved displays and bendable displays that are bent over corners in order to provide views in multiple directions. Up until recently, most LCDs had only 55 to 65 percent of the Standard sRGB/Rec.709 Color Gamut that is used in producing virtually all current consumer content – resulting in subdued colors in images, videos, and photos. This limitation results from the traditional reduction in brightness and power efficiency as the Color Gamut is increased (which can now be overcome using Quantum Dots). 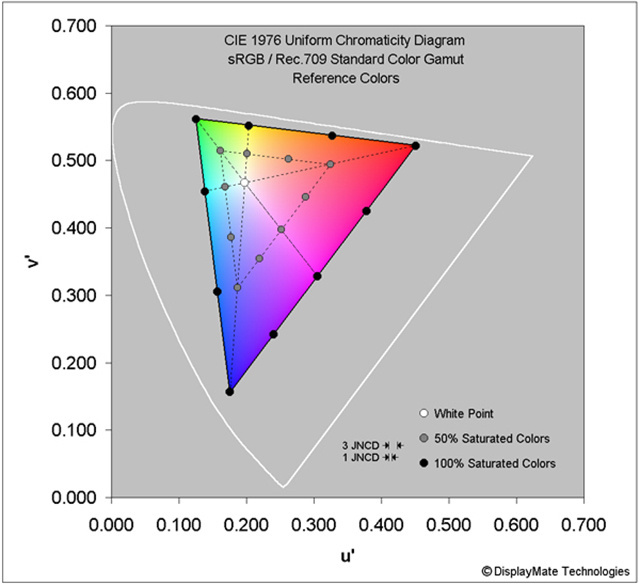 Most leading LCDs now have Color Gamuts greater than 85%, with the best close to 100%. The most notable laggards in 2013 were the iPad mini retina display and Microsoft Surface 2, both with just 63 percent of the Standard Gamut. 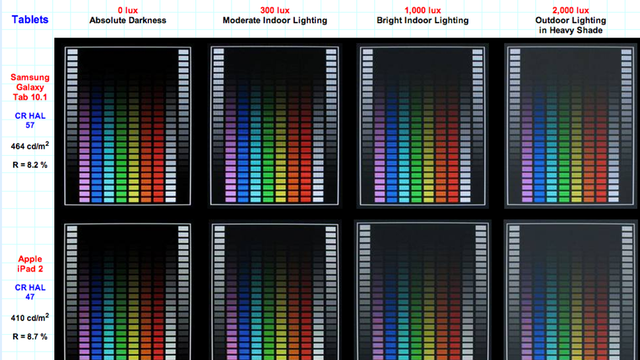 Quantum Dots mentioned above will play a major role in improving the Color Gamut of LCDs. Note that the sometimes referenced NTSC Gamut is long since obsolete and totally irrelevant, so please stop mentioning it. Displays advertised with Wide Color Gamuts greater than 100 percent of the Standard sRGB/Rec.709 cannot show colors that are not in the original image content so they instead produce distorted oversaturated colors. 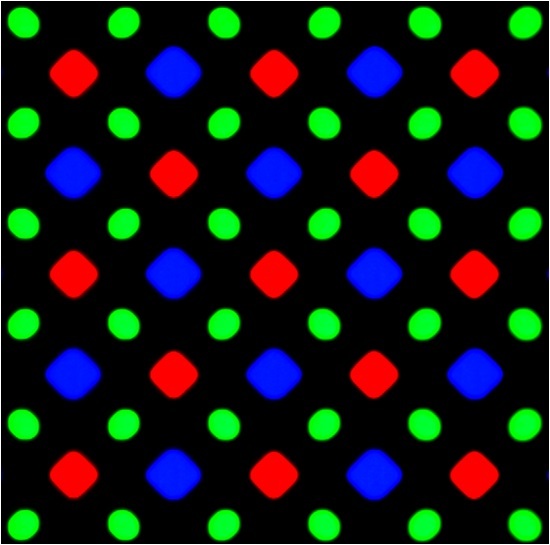 OLEDs currently have wide native Color Gamuts around 130 percent, but leading OLEDs like the Samsung Galaxy S4 and Galaxy Note 3 now include modes with advanced Color Management that reduces the native Gamut to approximately 100 percent and deliver accurate on-screen image colors. There is, however, a very important major advantage for displays with Wide Color Gamuts greater than 100 percent because Ambient Light washes out the on-screen image colors—and displays are almost never watched in absolute darkness. So with real-time Color Management that accurately adjusts the Color Gamut to values greater than 100 percent based on the current measured level of Ambient Light can then compensate for the reduction in color saturation, and produce accurate on-screen colors in Ambient Light, which we will discuss below. Picture quality, color fidelity and accuracy have been steadily getting better due to improved display technology, advanced signal processing, automated factory calibration, and increased competition. Our series of Display Shoot-Out lab tests and measurements show that the very best smartphones, tablets, and TVs are now comparable in accuracy to professional studio monitors. With good accuracy you’ll see high fidelity presentations of your digital photos, which is especially important because you often know exactly what everything should actually look like. Another advantage is that online merchandise will appear with accurate colors, so you’ll have a good idea of exactly what you’re buying and are less likely to return it. Potential downsides include on-screen food that will make you particularly hungry, and you will undoubtedly watch more shows, movies, and downloaded content when they all look great. If you’ve ever wondered why some colors are way off on a display—there are many contributing factors and causes including the Color Gamut, the calibrated White Point, the Intensity Scale, and possibly poorly implemented dynamic picture processing and Color Management. 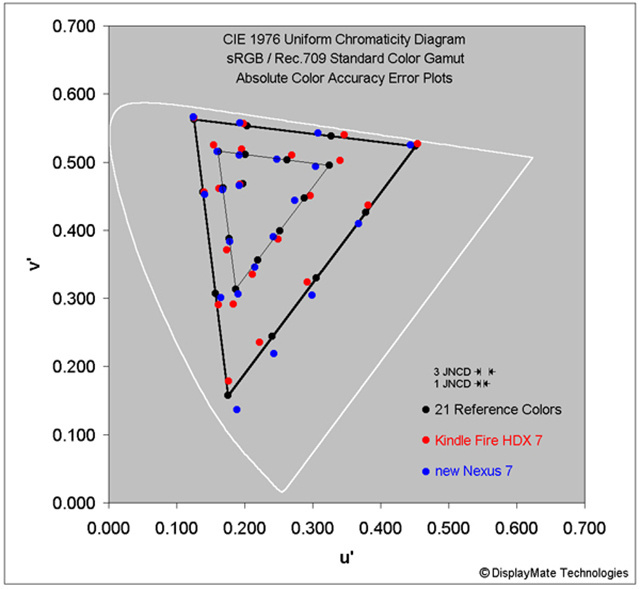 It’s possible to accurately measure and map the absolute color accuracy and color errors for any display using a spectroradiometer and proprietary test patterns, which we do in our Display Technology Shoot-Out article series. We provide both the Average and Maximum Color Errors in terms of Just Noticeable Color Differences (JNCD), and include a full Chromaticity Color Accuracy map, which is shown in Figure 2 below (click to enlarge for details). Visit DisplayMate for more on these color accuracy maps. 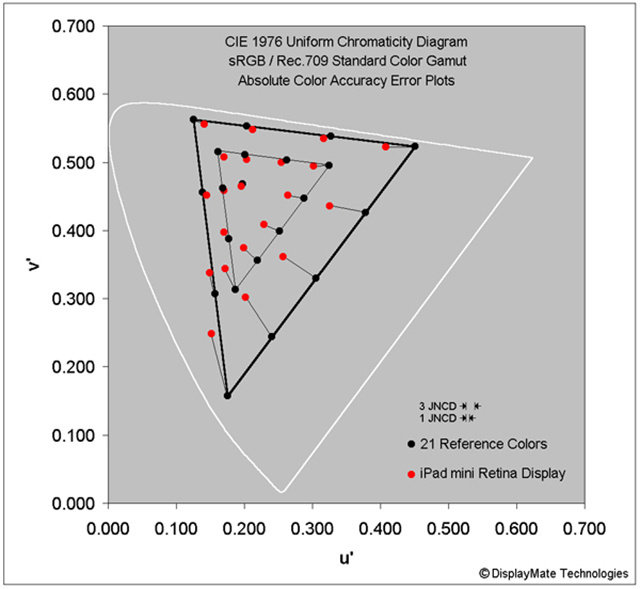 In 2013, the most accurate display we measured was the LG OLED TV, with an Average Absolute Color Error of just 1.3 JNCD, which is visually indistinguishable from perfect. 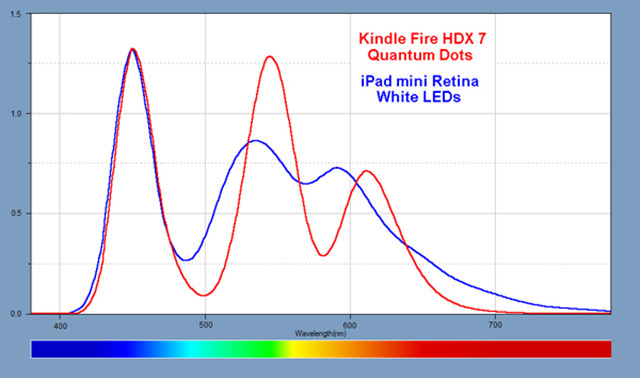 Figure 2 has Absolute Color Accuracy plots for the Kindle Fire HDX 7 and Google Nexus 7, and also clearly shows the much larger Color Errors for the Apple iPad mini retina display. In 2014 we expect to see major improvements in Absolute Color Accuracy resulting from Quantum Dots and improved Color Management processing. Selling higher resolutions has always worked well – from Standard Definition 720×480 to high definition 1920×1080 TVs, 8+ Mega Pixel digital cameras, Apple retina displays and competing 326+ ppi Smartphones and 264+ ppi Tablets. Now we’re seeing mobile displays with 450+ ppi and 4K ultra high definition UHD TVs with 3840×2160 resolutions and above. But, can you actually see the enhanced sharpness and resolution on a smartphone or 4K UHD TV? The above article explains the many issues that come into play. There is a limit to the visual acuity of the human eye—while a small percentage have better than 20/20 Vision, most people actually have less than 20/20 Vision. As a result there is a useful upper limit for display resolution and ppi—exceeding it doesn’t make practical sense because there isn’t any visual benefit and the display performance often decreases (and total device costs often increase significantly). So is there a good case for 450+ ppi Smartphones and 4K UHD TVs? Smartphones: If you hold a 450 ppi smartphone up really close (about 7.5 inches) you’ll be able to see all of the image detail if you have 20/20 vision, but to resolve even higher ppi you would have to hold it even closer, which is not likely in general use. So based on 20/20 visual acuity alone the practical upper limit for a smartphone is about 450 ppi. But there are a number of other advantages for moving up much higher than 450 ppi that we will discuss in the smartphones section below. TVs: For 4K UHD TVs the question is will you actually be able to see a visual improvement in image sharpness and detail over a 1920×1080 HDTV? For 20/20 vision if you have a 40 inch TV you’ll need to be watching from closer than 5.2 feet to see an improvement, a 50 inch TV closer than 6.5 feet, a 60 inch TV closer than 7.8 feet, a 70 inch TV closer than 9.1 feet, and an 80 inch TV closer than 10.4 feet. In the USA the average viewing distance for a TV is about 9 feet—for 20/20 Vision at this viewing distance you should have a screen larger than about 70 inches. To see all of the image detail on a 4K UHD TV with 20/20 vision you would need to watch from half of the above distances. So the larger the TV and the closer the viewing distance the better the case for 4K UHD—based on 20/20 visual acuity alone, TVs 80 inches and above are best for 4K UHD, while 40 inches and below don’t make sense (unless it’s a computer monitor because they are generally viewed at 2.5 feet or less). But there are a number of other advantages for moving up to 4K UHD that we will discuss in the TV section below. The screens on all displays are mirrors that reflect light from everything that is illuminated anywhere in front of them, including lamps, ceiling lights, windows, direct and indirect indoor and outdoor sunlight, which washes out the on-screen colors, degrades image contrast, and interferes with seeing the on-screen images. See Figure 3 below and this Shoot-Out article, which have screen shots of many displays in up to 40,000 lux of ambient light to show how the on-screen colors and image contrast degrade. See the rest of these ambient light screenshots here. One good way to counter the effects of ambient light is by reducing the screen Reflectance, which has been steadily decreasing—in 2013 we measured a record low of 4.4 percent (down from 8 to 15 percent in 2011). Another method is by increasing the display brightness—in 2013 we measured a record high of 684 cd/m2 (up from 300 to 450 cd/m2 in 2011). These will both continue to improve in 2014. 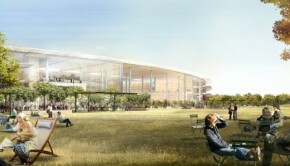 But there are other more advanced methods to improve display performance in ambient light that we’ll be seeing in 2014. 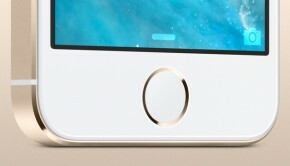 One is to use a display with a slightly curved (concave) screen that reduces reflections as mentioned above. Another is by using an Ambient Light Sensor to accurately adjust the screen brightness—most current implementations are close to useless but they are getting better. The most advanced method is to also use the Ambient Light Sensor to accurately vary the display’s Color Gamut and Intensity Scale to compensate for the washed out images resulting from ambient light reflecting off the screen. See Figure 4 above and this Shoot-Out article. In 2014 some displays may include all of these methods. All LCD and OLED displays have an internal backplane layer that has the electronic circuitry needed to control the millions of sub-pixels. Its performance is especially critical in high ppi displays. While most LCD displays still use amorphous silicon (a-Si), many high ppi LCDs use Low Temperature Polysilicon (LTPS), which has considerably higher electron mobility than a-Si, which allows the circuitry to be made much smaller. That results in significantly higher brightness and improved power efficiency, but also costs considerably more to manufacture. 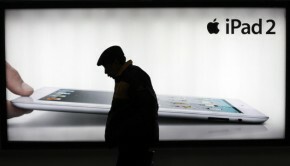 Most high performance smartphone displays now use LTPS, including the iPhone 5 and all mobile OLEDs (except flexibles). But most LCD tablets, monitors and TVs still use a-Si because their larger screens would cost considerably more to manufacture using LTPS. An alternative Backplane technology called IGZO (Indium Gallium Zinc Oxide), which has higher performance than a-Si, but lower cost (and performance) than LTPS, was supposed to be available in 2012 for Tablets, monitors, and TVs, but major production problems have significantly delayed and limited its availability in 2013. This will continue through 2014 as Sharp is the only major manufacturer that is beginning to ship IGZO displays. As a result, the two highest performance tablet displays that we recently tested, the Amazon Kindle Fire HDX 8.9 and Google Nexus 7, were the early adopters of LTPS for tablets, while the latest iPads still rely on lower performance a-Si and IGZO, which limits their brightness, Color Gamut, and power efficiency. For 2014, the continued problems with IGZO will benefit both LTPS and the much higher performance Metal Oxide backplanes now under development by CBRITE, which should begin arriving by late 2014. Since their initial rollout in 2010, OLED displays have been improving at a very impressive rate, with 20 percent or more year-to-year improvements in brightness, color management, color accuracy, resolution and ppi, and power efficiency, which we have documented in our in-depth OLED Shoot-Outs for the Samsung Galaxy S123, Galaxy S4, and Galaxy Note 3. OLEDs are also incredibly thin, just fractions of a milli-meter, which is a major advantage in mobile displays and especially for wearable displays (which also benefit from being curved and flexible). In 2013 both LG and Samsung launched curved 55 inch OLED TVs (with IGZO and LTPS respectively) and Smartphones with curved and flexible OLED displays (on flexible plastic substrates). For 2014 there will be further year-to-year improvements as above, plus many more larger, curved, and bendable/flexible OLED mobile and TV displays, including OLED tablets and smart watches. The remaining major challenges for OLEDs are reducing production costs and increasing production capacities. In 2014 the most significant development for high-end LCDs will be the increased adoption of Quantum Dots by many more manufacturers, which will improve the Color Gamut, Color Accuracy, display power efficiency, brightness and/or the running time on battery for mobile displays. Improved backlights and optical films for the LCD panels will also increase brightness, viewing angles, and power efficiency. Greater competition will result in a continued shift to higher performance LTPS backplanes and to panels with In Plane Switching (IPS), Fringe Field Switching (FFS), and Plane to Line Switching (PLS) that deliver excellent color and image contrast over wide ranges in viewing angle. And there are also a few curved LCD TVs, including an impressive and interesting bendable screen model from Samsung that will ship sometime in 2014. Below we discuss how the 2014 Display Technologies will play out in TVs, tablets, smartphones, and wearable display products. A major industry push for moving TVs up to 4K UHD started in earnest in 2013 and will continue building throughout 2014 and beyond. The biggest problem is that there is almost no 4K UHD consumer content available yet, so watching Full HD 1920×1080 content on a 4K TV still only produces a 1920×1080 image on a 3840×2160 display because up-scaling cannot provide new additional image detail that is not present in the original image. That will start to change in 2014 as some 4K streaming content will become available, and there is work on a 4K Blu-ray standard, but disc production is unlikely to begin before sometime in 2015. So in addition to streaming 4K content, UHD TVs can show high resolution digital photos, plus Smart TV and computer generated content with high resolution text and graphics, which will look really nice at 4K resolutions. Another nice application is watching 4 Full HD 1920×1080 programs at the same time, including browsing the web while watching TV. Picture quality is likely to be better due to superior panels and signal processing—including with regular 1920×1080 content. Be sure to see the 4K UHD section for information on visual acuity, screen size, and viewing distance. We’ve already discussed Quantum Dots and Curved Screens. 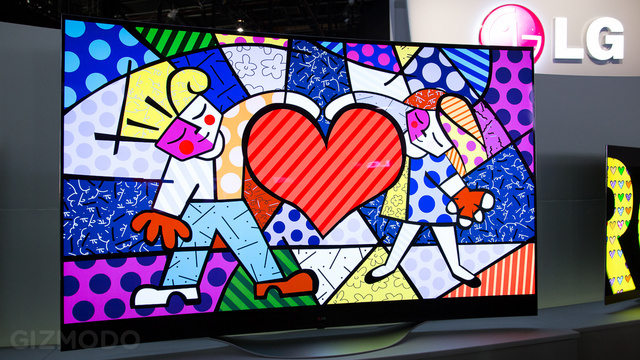 For 2014 there is a strong push for very large TV screens, from 80 up to 120 inches so far. Another 2014 push is for very wide screens with Aspect Ratios of 21:9, which nicely accommodate movies that typically have Aspect Ratios from 1.85 to 2.39—so no letterboxing necessary. Other emerging topics include Wide Color Gamuts (Rec.2020) and HighDynamicRangedisplays and content. 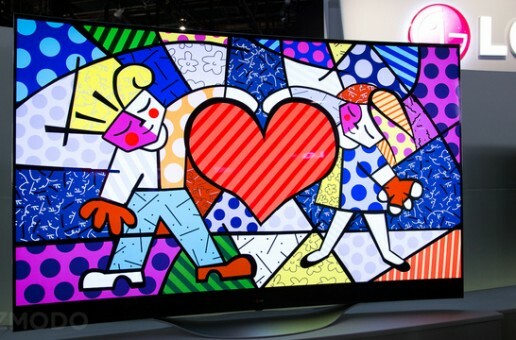 Be sure to see the OLED and LCD sections for additional information on TVs. While 2013 included a major shift to smaller 7-8 inch tablet displays from the first generation full size 9-10 inch displays, 2014 will include 12-13 inch tablet displays for the professional and education markets. Samsung has already announced a 12.2 inch TabPRO and Apple is rumored to be producing a 12.9 inch iPad. The screen resolution and ppi are also increasing, with high-end Android tablets moving up to 2560×1600 or Quad HD at 2560×1440 with 300-340 ppi based on screen size, and current Apple iPads at 2048×1536 with 264-326 ppi. However, a 12.9 inch iPad would only have 198 ppi, so for a retina display another higher resolution jump up to perhaps 4K 4096×3072 with 398 ppi seems likely. Also expected in 2014 are some high resolution OLED tablets and many more LCD tablets with LTPS Backplanes and Quantum Dots that will deliver very bright and Wide Color Gamut images as mentioned above. Tablet High Ambient Light performance will also continue improving, with the 2013 record holders Amazon Kindle Fire HDX 8.9 with a very low 5.0 percent screen reflectance, and the Nokia Lumia 2520 with a very bright 684 cd/m2 display. Screen size, resolution, and ppi will continue increasing for smartphone displays in 2014. While the screen sizes are creeping up, the maximum screen size is unlikely to exceed the current record holders of 6.1 inches for the Huawei Ascend Mate and 6.3 inches for the Samsung Galaxy Mega. Expect more curved screen displays and many more displays with Quantum Dots that will deliver very bright and Wide Color Gamut images as mentioned above. In 2013 a number of smartphones moved up to Full HD 1920×1080 5-6 inch displays with 400 to 468 ppi, including six that we tested with in-depth Shoot-Outs for an LG LCD Display, for HTC Huawei and Sony LCD Displays, for the Samsung Galaxy S4 OLED Display, and the Galaxy Note 3 OLED Display. For 2014, both enhanced technology and enhanced competition are pushing smartphone resolutions up to Quad HD at 2560×1440. LG is expected to announced their flagship G3 smartphone with a 5.5 inch Quad HD IPS LCD with 538 ppi, and Samsung is expected to announce their flagship Galaxy S5 Smartphone with a 5.25 inch Quad HD Diamond Pixel OLED Display with 560 ppi. As with TVs there are some advantages in going higher than the visual acuity for 20/20 Vision at typical viewing distances. For smartphones they include a closer match to digital photo resolutions, the ability to display Full HD 1920×1080 images with an additional 1.6 megapixels left over for displaying additional content at the same time, plus efficient and simple small integer rescaling of various HD and quad screen resolution formats to improve processing efficiency and resulting picture quality. Smartphone High Ambient Light performance will also continue improving, with the 2013 record holders Samsung Galaxy S4 with a very low 4.4 percent screen reflectance, and the Samsung Galaxy Note 3 with a very bright 660 cd/m2 display. The new frontier for displays are wearable. They are primarily variations on wrist mounted smart watches, but also include eyewear like the Google Glass. For smart watches the display is the key and a major new challenge because they need to be very small, very thin, and have major power constraints to maintain a greater than 1 day battery running time, yet they must deliver bright images in very high ambient light. As expected, most existing smart watches have around 1.6 inch displays. But what is especially interesting is the variety of display technologies that are already in play, including a surprise appearance of Qualcomm’s Mirasol, a unique color reflective display technology that has been in limbo for a while. Many of the displays are transflective, meaning they can transmit a backlight or reflect surrounding ambient light, which saves power and improves screen visibility and readability in high ambient light. The notable existing smart watches include a traditional transflective LCD (Sony SmartWatch 2, 220×176 with 176 ppi and 16-bit color), a black and white Transflective memory LCD that is being called e-paper (Pebble, 144×168 with 176 ppi and 1-bit color), a reflective color Mirasol display (Qualcomm Toq, 288×192 with 223 ppi), and a color OLED (Samsung Galaxy Gear, 320×320 with 278 ppi). Pluses and Minuses: All of the reflective displays are always on, readable in sunlight, and include a backlight for when it’s dark. OLED displays are normally off but turn on automatically with a wrist movement, and have better response time and viewing angle performance than the other displays. LCDs are more power efficient, but currently are flat and thicker, while OLEDs are much thinner and are now curved and flexible. Surprisingly, none of the displays include an Ambient Light Sensor for Automatic Brightness control, which could improve the battery running time significantly. What’s Next: Not surprisingly, there are rumors that the upcoming Samsung Galaxy Gear 2, expected in March or April of 2014, will feature an innovative curved and flexible high ppi OLED display. The one display technology that is conspicuously absent from smart watches is Pixel Qi, which are LCDs that have a reflective black and white mode that is viewable in direct sunlight and also a full color mode using a Backlight. A good guess is that Google might introduce a smart watch based on Pixel Qi display technology. For manufacturers we offer Consulting Services that include advanced Lab testing and evaluations, confidential Shoot-Outs with competing products, calibration and optimization for displays, cameras and their User Interface, plus on-site and factory visits. See our world renownDisplay Technology Shoot-Out public article series for an introduction and preview. DisplayMate’s advanced scientific optimizations can make lower cost panels look as good or better than more expensive higher performance displays. For more information on our technology see the Summary description of our Adaptive Variable Metric Display Optimizer AVDO. If you are a display or product manufacturer and want to turn your display into a spectacular one to surpass your competition then Contact DisplayMate Technologies to learn more.